When some writers have more story ideas than they can pursue right now, they freeze up. These five steps can thaw that freeze and allow the writing to flow. 1. Write your ideas down. 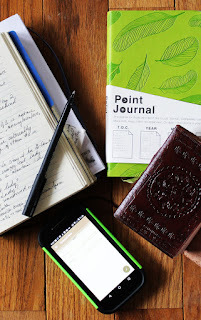 It doesn’t matter if you use an app like Notepad or an actual paper journal, record your ideas. Once you’ve written them down, you’ll stop worrying about forgetting them. Don’t worry about the quality of the idea. Write it down so you can get to the next step. 2. Check your time. How much time do you have to write? If you are a student with a paper due or there is a big event, like a wedding, birth or move, in the near future, your writing time is probably limited. If that is the case, you might want to pick a shorter project to work on, a magazine piece or poem vs. a novel or series idea. I’m not saying one type of writing is easier but that a shorter project can often be drafted in less time. 3. Check the timeliness of your ideas. Some ideas, like those that celebrate an anniversary, will be marketable now, but not in the future. Seasonal ideas are marketable six to nine months in advance. Is there something that is timely or seasonal? Then you might want to work on that. 4. The idea that won’t let you go. Do you have an idea that is pursuing you? One that you find yourself thinking about at various points throughout your day? Then put that one at the top of your list. 5. Pick three. Once you’ve considered the above, pick three ideas. Rank them first, second and third. Then get to work on #1. You pick three because, once you get started, you may hit a block. Maybe you are waiting for information you need to write the next section. Or you may need to think through a problem. With three “top” projects you can rotate through them and write as your mood, energy or time allows. This can help you keep writing instead of coming to a complete halt. Having dozens of ideas is a blessing as long as you learn to work around them and keep the words flowing. If there are additional techniques that work for you, please consider sharing them in a comment below. To find out more about Sue Bradford Edwards' writing, visit her blog, One Writer's Journey. Sue is also the instructor for Writing Nonfiction for Children and Young Adults. The next session begins May 20th, 2019. Sue--You are probably like this, right? Don't you have a flood of ideas flowing into your brain on a regular basis? At least that's what it seems like to me, since you are always working on several books at once. Sue, may I use this column as a handout for a retreat I'm leading next weekend? All bio info and links will be included and I'll add a statement that this post is used with permission. Look forward to hearing from you--thanks. Sure! As long as I get credit and you direct everyone back to the blog, that would be fine. I won't have any ideas for a few days or a week and then I have five. In truth, I thought everyone was like this but I have since had reality explained to me. But I'm like this with everything. I don't know what to make for dinner, what to do for the fundraiser . . . oh look, now I have six ideas. Sue ~ I feel like you wrote this just for me. :) As you know, I always have a million ideas and suffer from project indecision, which leads to overwhelm. I write all my ideas down in the Google Docs app on my phone. That page is becoming ridiculous. But I love the idea of writing them down because I'll look at that page and not remember that I wrote something. Often, I'll jot notes at night when I'm in bed and my phone is closest to me. Timeliness! Yes, that's a great point. I feel like I often have an idea that hasn't been done before, and then right as I start to do it, I find out that someone else is working on the same thing but ahead of me. Ugh. It's the worst. I also like the idea of narrowing them down to the top three. I have so many things I want to work on (but I also have some freelance assignments in the mix) so I guess for me it would be: paid assignments at the top, then the project you can't get out of your mind (for me, an essay and major revisions on my second YA novel). I have a whiteboard in my office that I used to use for these types of my list and it's been neglected the past few months. Thanks for the nudge! You are going to bring your own unique history to that project so go for it! I mean it. Whiteboards are amazing. I'm about to repaint my office door with chalkboard paint. I'll do my planning on the back of the door where no one will brush it off as they walk down the hall. My bulletin board will be on the other side.